These picture postcards were issued by the Jewish Welfare Board for use by returning United States troops after the end of the First World War. They were handed out on the troopships, and a soldier or sailor could send an "arrived" message to their loved ones. While on the ship or still at the dock, the military men were officially "overseas", so the cards could be sent without postage. Once the soldier or sailor entered the US, the cards required postage. 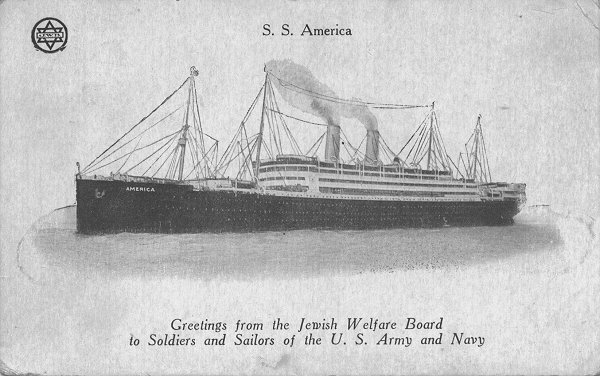 The Jewish Welfare Board was not the only welfare organization to provide free safe-arrival cards for troops, but these cards are unique in that they depict the actual troopships used to return the men from Europe. The images were derived from several sources (some pre-war), and the Copyright messages reflect that. Perhaps the JWB received special treatment regarding royalty payments, since this use was "for the troops". These web pages are dedicated to providing information about these picture postcards, and other troopship cards. In addition there is information about the WW I troopships themselves. There are a number of troopship images on my Flickr account, that include some JWB cards. You may have seen a picture postcard of a ship that may be from this era, but it is not dated. Here is a writeup on identifying possible troopship cards from the WW I era. I've acquired images of many of these cards, and own some myself. At this time, I have few extras, so cannot trade. These cards show up regularly on eBay auctions. My book listing First World War facilities (2nd edition) mentions these, and other, postcards in light of their use by returning troops.